Practicing social responsibility at the corporate level has gained significant importance in recent years given the growing demand by consumers for products and services produced and delivered under ethical standards, with adequate labor conditions and respect to local communities and competitors. This is why the Organization of American States (OAS) has been promoting Corporate Social Responsibility (CSR) among businesses throughout the Americas. Over the last several years, the OAS has adopted several initiatives to support CSR and promote the spread of business ethics in the region. It has also generated new partnerships and helped promote responsible business practices in the region through the work done by three of its entities including the Executive Secretariat for Integral Development (known as SEDI by its Spanish acronym), the Young Americas Business Trust (YABT) and the Trust for the Americas. Zakaria El Goumiri, an OAS development specialist, explains that “though the practice of CSR is fairly common in the region, its definition is still broad and remains under debate. Everyone speaks about CSR in different terms.” Despite this, he acknowledges that CSR generally refers to the self-regulation mechanisms employed by businesses to comply with the law, and adhere to ethical standards and international law. Corporate Social Responsibility is rooted in business ethics, and CSR practices have grown in popularity alongside ethical consumerism, which refers to the use and purchase of products and services a consumer believes were made or provided ethically. SEDI works to support the businesses of the Hemisphere in becoming more competitive, safe, and responsible, while meeting their own financial goals and contributing to the social and economic development of the region by helping those in their local communities overcome poverty. For example, in 2003, the OAS, with financial support from the Inter-American Development Bank (IDB) and the Canadian International Development Agency (CIDA), developed a CSR project with Forum Empresa, a CSR private sector network, involving organizations and small and medium enterprises (SMEs) in Brazil, Peru, El Salvador and Chile. Some of the outcomes of this program included providing training and technical assistance to hundreds of companies and their supply chain partners, consolidating a training methodology to provide SME staff the ability to analyze and develop a CSR strategy and make their colleagues aware of the basics and importance of CSR, and consolidating a network of CSR organizations in the region. In 2006, again with CIDA support, the OAS developed a similar initiative for Caribbean countries that targeted Barbados, Guyana, Jamaica, Saint Lucia, and Trinidad and Tobago. The principal partners of this initiative are the United Nations Economic Commission for Latin America and the Caribbean (UNECLAC), the Caribbean Association of Industry and Commerce (CAIC), and the Young Americas Business Trust (YABT). The goal of this second project was not only to promote the importance of CSR among small and medium size enterprises in the Caribbean, but also to develop a business strategy to showcase the positive impact that CSR has on business competitiveness and performance through the creation of partnerships between multi-national corporations and small and medium enterprises. In September 2009, the OAS hosted a roundtable discussion in Washington, D.C., entitled, “Corporate Social Responsibility in a Time of Crisis” to highlight the importance CSR in the countries throughout the region and foster the exchange of best practices. Participating CSR experts and business people agreed that Corporate Social Responsibility is related to individual responsibility and to a citizen’s contribution to democracy to generate sustainable growth and security. Furthermore, since 1999, the YABT—a non-governmental organization affiliated with the OAS that supports entrepreneurship among young people in the Americas—has carried out diverse programs in leadership, training, technology and strategic alliances, all of them related to the creation and adoption of responsible strategies to benefit local communities. Likewise, the Trust for the Americas awards an annual prize to corporations and individuals whose efforts have contributed to development in the Hemisphere. In 2009, the Trust awarded its Corporate Citizen of the Americas Award to Itau Unibanco, a bank headquartered in São Paulo, Brazil, in recognition for its program, “Portuguese Language Olympics—Writing the Future.” This is a private initiative to train teachers from the Brazilian formal public school system. The annual award seeks to generate greater awareness among regional entrepreneurs about the positive impact of socially responsible practices. The potential benefits of CSR are clear for many, including an enhanced brand image and reputation, greater employee loyalty and motivation, increased work productivity, reduced operating costs, local community support, more efficient production and reduction in waste, a better ability to adapt to change, a stronger capacity to communicate and gain credibility, increased costumers loyalty, and greater commitment and retention of the best professionals. 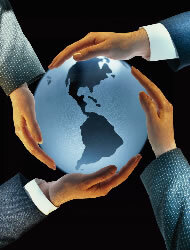 Nevertheless, the development of CSR in the Latin American and the Caribbean continues to be somewhat incipient compared to what it has become in other countries, and given these circunstances it is clear that a global interest in CSR has created pressure on regional companies to incorporate the concepts and philosophy of CSR to be able to compete more effectively.